In the lead up to this year's Mardi Gras, Canadian indie rock icons Arcade Fire are looking back at both the Kanaval season and their Reflektor tour via the release of a low-key live performance of their "Here Comes the Night Time." Full of costumes, dancing, and a hell of a lot of cow bell, the footage is streaming now. 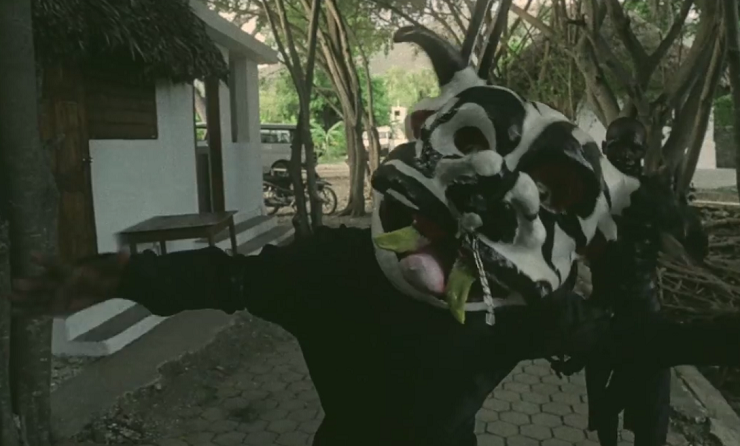 Actualized by the Artists Institiue - Haiti, the video finds Win Butler leading the group through a campfire lit jam of the track in Jacmal, Haiti. Regine Chassagne gets extra-rhythmic on the piece as she whaps on a cow bell, though the rest of the group get into the groove with their respective stringed instruments. Also seen are various Haitian locals getting ready for Kanaval, whether putting the finishing touches on their masks and costumes, or dancing with the band. You'll find the joyous jamboree down below. As previously reported, members of Arcade Fire are due to perform at the Kanaval KANPE benefit on February 19 at Montreal's Société des arts technologiques (SAT). You can find out more about the charitable event over here.